Wow. 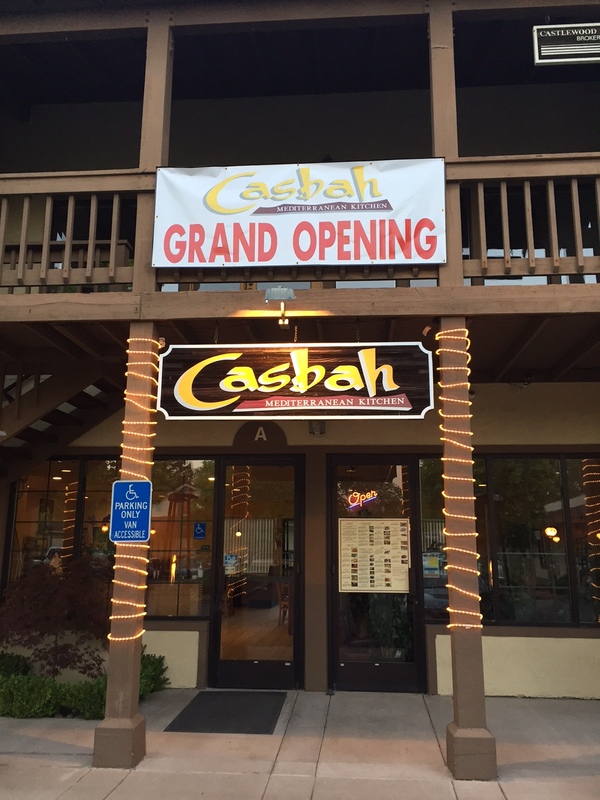 Much has changed on the local food scene, with some places (like Voodoo Kitchen/The Cove Bistro) having come and gone, alas, unremarked-upon by Eating in Pleasanton. But I don’t want to bury the lede! The most important development of the last four years — to me, at least — is the arrival, at long last, of an authentic Sichuan restaurant. 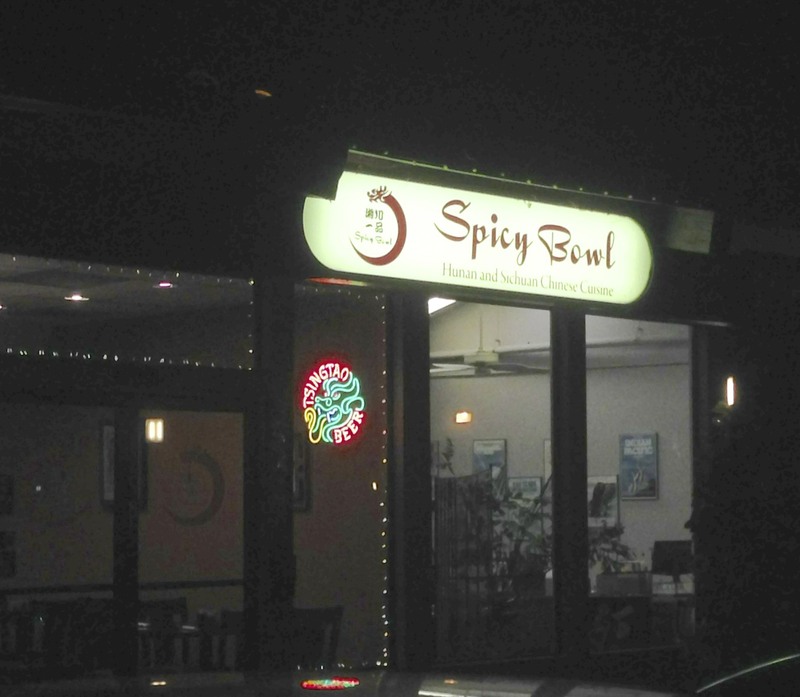 It’s Spicy Bowl, which took the place of the (revived but unremarkable) Blessings, in a strip off Santa Rita Road. I was on a prowl last week for new Chinese places, and the first one I tried was Jade Garden, which replaced the not-bad Formosa Cafe (which itself replaced Bo Happy, which had a “secret menu” including some Sichuan and Shanghai specialties). Sadly, Jade Garden was not as good as either of those, and was strictly standard American-style Chinese. 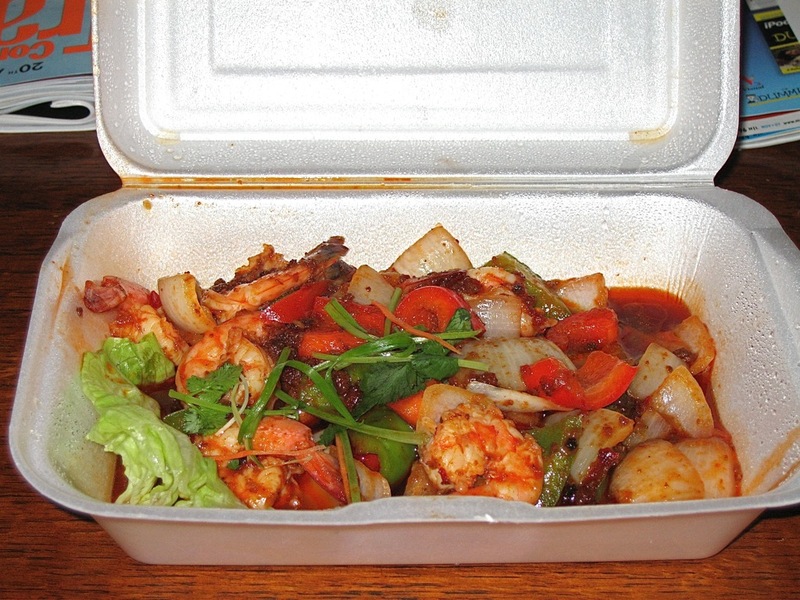 They have an attractive take-out menu, nicely printed and with English and Chinese for every dish. The menu had a number of well-known Sichuan and Hunan dishes, as well as more Americanized fare. I decided to order two “classic” Sichuan dishes, Chicken With Explosive Chili Peppers aka Chongqing Spicy Chicken (Chongqing lazi ji, 重庆辣子鸡) and Spicy Beef With Floming [sic] Chili Oil aka Sichuan Boiled Beef (shui zhu niu, 水煮牛), and an appetizer of Cold Sliced Pork With Spicy Garlic Sauce (suan ni bairou, 蒜泥白肉). All three were excellent, and the chicken and the cold sliced pork were possibly the best I have ever had of those two dishes. The pork slices were presented rolled up and half-submerged in the strongly garlicky and spicy red sauce, and the chicken wings (you can get boneless or bone-in; I chose the original bone-in) were amazing. They are dry-fried without batter in a wok with scallions, garlic pieces, chopped scallions, and many, many red peppers and Sichuan peppercorns. The chicken pieces came out wonderfully crispy but not greasy (no batter, remember!) and the dried red peppers were cooked to almost the point of blackening, giving them a deep smoky aroma. The boiled beef was tender and in a rich, oily sauce with vegetables. A slight grade below the other two, but still very worthwhile. Needless to say, I got two dinners out of that order, and will be back very soon to try some other specialties like wontons in spicy sauce (hongyou chaoshou, 红油抄手）and Shredded Pork With Garlic Sauce aka Fish-flavored Pork (yuxiang rousi, 鱼香肉丝). There have been lots of changes in the Pleasanton eating scene in the last few months — more than the ones below, but with the exception of The Farmer (which I haven’t tried yet), these seem to be the most significant. First, the departure. Mahalo Grille was a relatively ambitious attempt at Hawaiian fusion cuisine, with notes from Mexico, the Caribbean, and even Spain (paella). The food was good – I never had a bad meal there, and the waiters were friendly and usually more or less competent, but the owners seemed to lack the management skill to make it a success. Dishes were added to or removed from the menu arbitrarily, and the restaurant’s hours were inconsistent and puzzling. (One example: Saturday lunch. Last summer and fall, every place on Main Street’s restaurant row was packed with diners, indoor and out, many of whom came from the farmer’s market. Mahalo, however, was inexplicably closed.) In any case, after two months with the windows papered over and “closed for remodeling”, and a story about water damage from early winter storms, it looks like Mahalo is gone for good. It’s a good space, and I hope it remains a restaurant. And now to happier developments. The former C&D Bistro, née Claude & Dominque’s, was a beloved romantic French restaurant. 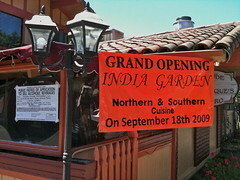 After Claude and Dominique’s retirement, though, it proved unsustainable, and now, with new owners and new decor, has become India Garden. There has not been any Indian food downtown since the departure of Sansar (which was not particularly good). Indian Garden has a menu of northern and southern Indian cuisines, a step up from previous decades in which the only available cuisine was Punjabi. On my visit, the fish pakoras were tender and flavorful, and not at all dry or greasy. The main courses of lamb korma and south Indian shrimp (that’s the name on the menu) were prepared with care and were delicious. The korma is a mild sauce made with yogurt, cardamon, and cumin, with nuts, and was paler and creamier than many other places. (It’s more similar to the UK version of korma than the Mughal original.) The south India shrimp featured fresh, flavorful shrimp in a spicy tomato-based curry and was very good. India Garden will definitely be on my regular rotation. Up next is Saigon, which took over the space in the Old Cheese Factory building that was recently Oak House (which I never made it to during its short tenure). 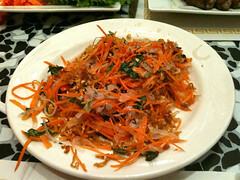 Saigon is a traditional Vietnamese restaurant with the classics — rice vermicelli and rice noodle dishes, appetizer rolls, rice plates, and stir-fried and clay pot specialties. (There’s also pho and hu tieu, of course, as well as special hot/soup soups and fire pots.) We shared the imperial rolls (above average), lemon beef (rare beef) salad, and beef rolls with onion inside over vermicelli with shrimp and fried rice. Everything was very good and I’m heading back there for take-out tonight. Alas, Blessings’ return was somewhat of a disappointment. It’s not so much that the food has changed, but that we have. Americanized Chinese food was the best we could hope for in the 1970s through the 1990s in Bay Area suburbs, and it was often quite tasty food, even if it was just a “safe”, deracinated version of actual regional Chinese cuisines. But as Chinese-American communities, immigrant and American-born alike, expanded from the inner-city Chinatowns to the suburbs, and built places like Milpitas Square or Ulferts Center in Dublin, you can get real Chinese food out here now, and the old stuff just doesn’t seem as good. The pot stickers were fine, but the kung pao trio (chicken, scallop, and pork) had a gloppy sauce, few peanuts or peppers, and only one scallop, so far as I could tell. The orange beef, marked with a “spicy” symbol, was basically broccoli beef with a slightly tangy orange-flavored sauce. The one interesting dish was Marco Polo noodles with pork, which seemed to be something like Sichuan noodles without peppers, and was reasonably tasty. Saved for last, and possibly best, is Jiou Yuan, which took over from Panda on West Angela Street. Panda was friendly but unremarkable, so when it closed, and the liquor license transfer sign went up, I was a little excited. The restaurant’s sign itself was covered by a “Grand Opening” banner, so I stopped in for take-out last Friday, and I was very nearly the restaurant’s first customer on their opening day! 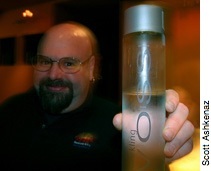 I met the owners and staff and welcomed them to the neighborhood (it, along with Senro, are the two restaurants closest to my house) and wished them a long and prosperous tenure. As readers might know, I am a beginning student of Mandarin and written Chinese, so after pleasantries I asked if there was a Chinese menu, and indeed there was, though it was just the regular menu with Chinese translation. That’s a good start, though, and I was able to order some favorites by their Chinese names — hongyou chao shou (wontons in red oil [spicy sauce]), as well as Sichuan fish fillet (Sichuan chao yu pian). Jiou Yuan is definitely an authentic Chinese restaurant, but since most of its customers will not be Chinese or Chinese-American, they need to tone it down a bit – hopefully not too much. I hope to continue the conversation with them on my next visit. On Friday afternoons I’m usually downtown, often sitting in Tully’s Coffee before dinner. Summer Fridays in downtown Pleasanton tend to be crowded, with the free concert in Wayside Park and the outdoor dining scene on Main Street. 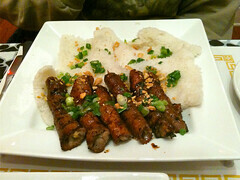 I had a hankering for some authentic Chinese food, in specific, a restaurant in Milpitas Square called Nutrition House. It’s one of my favorites, and I’d passed it by the day before on the way home from a meeting in San Jose, but was willing to head all the way back down there and pick up some some takeout. 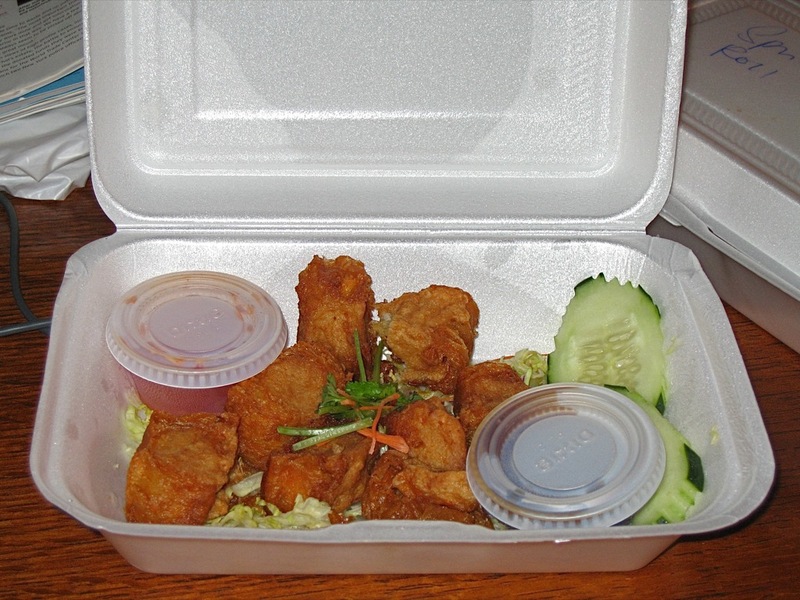 I confess was too flabbergasted to engage in any repartée, so I explained that I was ordering takeout Chinese food. “And you decided to do that here because…?” The tone of her voice was exactly that of Dana Carvey’s “Church Lady” character. So, we exchanged a few pleasantries, I introduced myself, and she stood there looking dubious for a moment, and then walked off. I can only imagine what nefarious mischief she suspected me of (casing houses to burgle? looking for children to abduct?) and briefly considered a facetious reply along those lines, but thought better of it, not really wanting to have to answer questions from a sheepish and embarrassed police officer. The incident left me with an odd feeling. While I generally support neighborhood anti-crime activities — including Neighborhood Watch — being questioned by the block’s Mrs. Nosyparker as to my identity and business while legally parked on a public street was somewhat intrusive and a bit creepy. I asked her if there had been any specific incidents that led to her suspicions of strangers, and she demurred, saying that she kept a watch on everyone. Indeed. In any case, the second odd (though not unexpected) encounter was when I called Nutrition House a few minutes later. I had the menu, which is organized into sections with letters, and was going to try to order S5, S7, D15, and B37 (I think; the first two are northern dim sum small plates), but unfortunately, no one who answered spoke enough English to take the order. I apologized (when I’m there, pointing and using the few words of Chinese I know works fine) and said I’d come there another time. It’s a very Chinese Chinese place; the English name of the restaurant is never used (and isn’t even on the sign, I don’t think); it’s really called Wu bing er yu, “Five loaves, two fishes” and its web site is www.5bing2yu.com. So I decided to get sushi instead. Senro is my favorite, but it’s difficult on Fridays unless I’m on foot or at Tully’s; having given up my downtown parking space, I wasn’t going to get another, and their lot is almost always full. So I headed up to the other sushi place I like, Tomo, and got a nice takeout plate of rolls and sashimi. Another freaky Friday in Pleasanton, I guess.